To put it simple, we must multiply the colonies that better defend themselves against the diseases, and those who are less able to handle it, we must eliminate. Ie do not kill, but solve the health problem they have, then remove the queen immediately and replace her by another we have bred according to certain criteria. In order to make a choice at all, we need accurate records of each inspection of each hive. I write with a felt pen all I see, with date, outside on the hive box and at the same time in a book. Each hive has its own number. This information then goes into the PC and also into a PDA (pocket computer) that is always at hand. So I can trace every colony up to 9 years to see what happened. 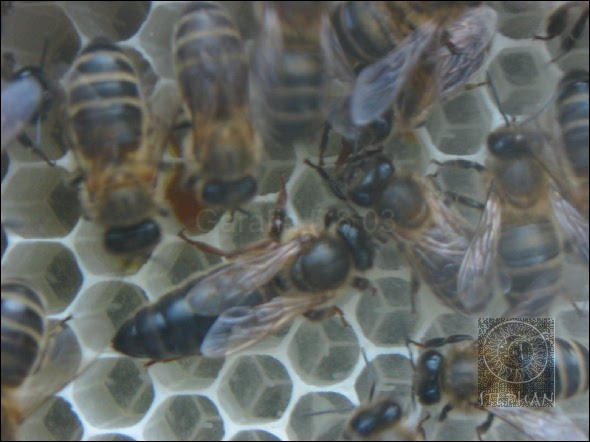 So we have to breed queens, in some way, from our best hives. Anyhow, there are many different ways. In the next report I will explain how we do it. Let us imagine in practice that we have 100 hives of small cells. Of those 100 hives, in spring 30 of them showed quite a few bald headed brood and of these, 10 also built the the small cells very well. We breed now 90 new queens from the hives which showed these two qualities, and then we must pass them as quickly as possible to the remaining 90 hives that are not showing such good qualities (this is simplified, just to understand) and eliminate their queens. Than we have reached a much better position than before. But this must happen quickly and we must have a management that can adapt quickly to changing situations. How we achieve that? I describe this in the next report , the breeding of queens. The smaller the hive is from where the virgin queen leaves in order to copulate, the closer the mating takes place. 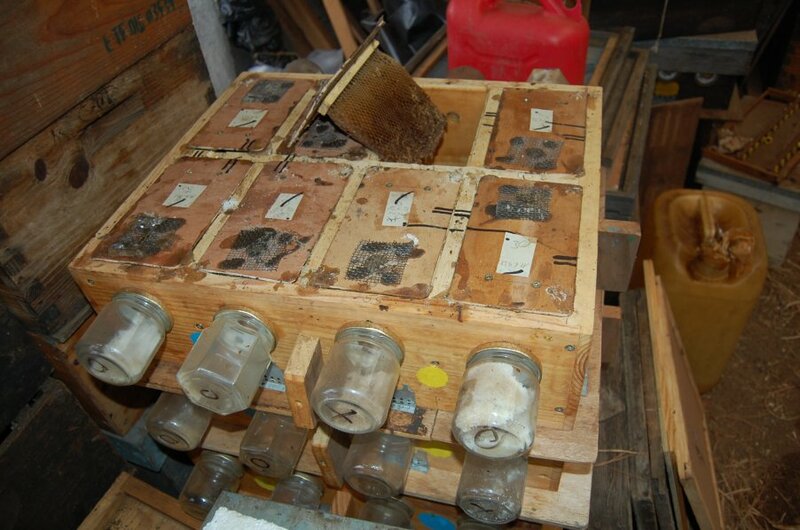 Ie, we use very small mating nucs and arrange our hives exactly as suggested by the study of Erik. We put the best hives, with the best drones in the center bee yard and the worse more far away. In the center the mating nucs are situated. And it is in fact so that the drones already apparently are waiting at the hive entrance ;-). You can observe then how the queen rushes through the air and some drones behind following her. We have another advantage with our drones. They are of course much smaller and therefore much more agile and faster than the drones from large cell hives. So they have a better chance to get even faster to our maids. The mating nucs we make here simply by cutting a standard Langstroth box in a height of 15cm and divide the space by boards into eight departments, each with an entrance hole, a cover, two bars with soldered 4.9 mm foundations and a feeding jar of 250g, which is screwed on the outside, to see how much Candi has already been consumed. My son Luca and I have made a short video about our queen breeding, which you can see in the next chapter of queen breeding. There you can also see the mating nucs. I would like to add one very important point here, which is based on the experience of many. At the beginning, when a beekeeper starts with the system by Dee Lusby, the bees first have to learn how to defend themselves. Each hive has to passs a crisis, apparently, and then it turns out, whether he wins or loses. We can take influence in different ways. Basically, we should start to work ONLY with nucs in the beginning. No large hives, until 80% of the nucs survive by themselves. Then we can proceed to normal hives. It is always much easier for the nuc to deal with varroa. In practice this means when a colony fills a box and is good crowded, we make a nuc with the queen. Everything must be very strong. It will be good to take 3 capped brood frames, the queen, honey and pollen and give them into another box at the same apiary but with the entrance orientated to another direction. Ie the parent hive has no queen and breeds a new one from the open brood. This will also cut off the varroa reproduction. The same is happening in the nuc because he loses his entire flying bees returning to the parent hive. Thus he also has a breeding break and also the breeding of varroa truncated. This is a mayor advantage in the beginning, until they can defend themselves. A few years ago I got six strong hives of large cells from a friend in Don Pedro, in the north of the island, put them on small cells and again and again I made new nucs. At the end of the year we had over 30. Everything is possible if you do everything in the right time and everything must be very strong.